칼스버그(Carlsberg)는 그저 유명한 덴마크 맥주 브랜드만이 아니다. 칼스버그라는 이름은 덴마크의 역사와 미래에 크고 중요한 일부다. 맥주가 아니라 사회와 꿈, 희망이다. 칼스버그라는 이름이 칼(Carl)의 언덕을 뜻하듯 무언가 성취하려면 산 한 두개는 넘어야 한다는 걸 역사가 보여주지 않나. 덴마크 사람들이 늘 좋은 맥주를 만들었다고 생각할 지 모르겠다. 최소한 바이킹이 뫼(Mjød∙봉밀주)를 즐길 때부터는 술을 잘 만들었다고 말이지. 하지만 이건 착각이다. 19세기만 해도 덴마크에는 맥주가 두 종류 있었다. 좋은 맥주와 형편 없는 맥주다. 형편 없는 맥주는 모두 덴마크산이었다. 반면 좋은 맥주는 모두 외국산이었다. 독일 하이네켄(Heineken) 같은 맥주 말이다. 한 남자는 이런 사실을 바꾸고 싶었다. 야콥 크리스티안 야콥센(Jacob Cristian Jacobsen)은 덴마크인에게 많은 것을 가르치고 싶었다. 그 가운데 하나가 훌륭한 맥주를 만드는 법과 방화 건축물을 짓는 방법이었다. 하지만 야콥은 보수적인 사람이었다. 전통을 중시하는 야콥은 현대적인 아들 칼(Carl)과 늘 마찰을 빚었다. 칼은 아버지 주조소 건너편에 자기 주조소를 지었다. 이것도 충분치 않았는지 칼은 아버지의 주조법을 훔쳐내 개량했다. 칼은 아버지보다 더 빨리 맥주를 양조하는 법을 알아냈다. 이것은 자신이 예술에 돈을 쏟아붓는 것 말고도 더 많은 일을 해낼 수 있다고 증명하려는 몸짓이었다. 하지만 아버지에게 반기를 드는 일은 아버지와 아들의 전쟁으로 치달았다. 다른 가족과 달리 영향력이 막강했던 야콥센 집안의 분쟁은 곧 많은 사람들 사이 갈등으로 불거졌다. 하지만 전쟁을 끝내야 할 사람은 싸움을 시작한 아버지와 아들 두 사람이라는 사실을 모두 알고 있었다. “너무 늦기 전에 하라(Do it before it’s too late)”는 말이 있다. 야콥은 이 말을 따랐다. 그는 아들을 초대해 이탈리아 로마로 여행을 떠났다. 이번에는 단 둘뿐이었다. 5년에 걸친 전쟁은 마치고 로마에서 부자는 다시 동맹이 됐다. 부자가 화해한 뒤 며칠 만에 야콥은 숨을 거뒀다. 아들 칼은 아버지의 유해와 함께 로마에서 돌아왔다. 두 사람이 극적으로 화해하기는 했어도, 수 년 동안 분쟁을 벌인 탓에 칼은 아버지의 유산을 한푼도 상속받지 못했다. 아버지의 모든 재산은 칼스버그 재단에 넘어갔다. A mini football table with Carlsbergs avertissements inside and outside. Carlsberg wagon from 1922 that was used to deliver beer around in one part of Århus. 칼스버그는 훌륭한 맥주를 만드는 일과 더불어 많은 일을 해냈다. 수년 동안 아버지 야콥과 아들 칼은 덴마크 예술사와 건축물을 지켰다. 다른 부자와 달리 두 부자는 덴마크 민중 편에 서 있었다. 두 사람은 모두 그들의 부와 지식을 덴마크 민중과 나누고 싶어했다. 아버지는 과학 분야에, 아들은 예술에 힘쏟았다. 칼스버그 미술관(Glyptoteket)과 도서관, 심지어 몇몇 성채도 두 사람이 생전에 덴마크 사회에 남긴 선물이다. 칼스버그는 여전히 가족 회사다. 여러분 역시 가족과 함께 칼스버그 말이 끄는 오래된 마차를 타고 칼스버그의 기념비적인 건물을 둘러볼 수 있다. 칼스버그의 역사뿐 아니라 덴마크의 역사과 기억도 단박에 여행할 기회다. Carlsberg is not only the name of the famous Danish beer. It’s also the name of big and important part of the Danish history and future. It’s not only about beer. It’s about society, dreams and goals. Just like the name Carlsberg that means mountain of Carl’s the history also show that if there’s something you want you need to cross a mountain or two. You might think that the Danish people always have been good at making beer. Or at least since the Vikings and their “Mjød”. But that’s not the truth. Back in the 19th century, all beer in Denmark was divide into good and bad beer. All the bad beer were danish and all the good beer were foreign beer like the german beer Heineken. One man wanted to change that. Carls father J.C. Jacobsen wants to teach the danish people many things. Among those things, he wants to teach them how to make good beer and how to make fireproof buildings. But J.C was a very old fashion man and that gave him troubles with his son Carl who were a very modern man. 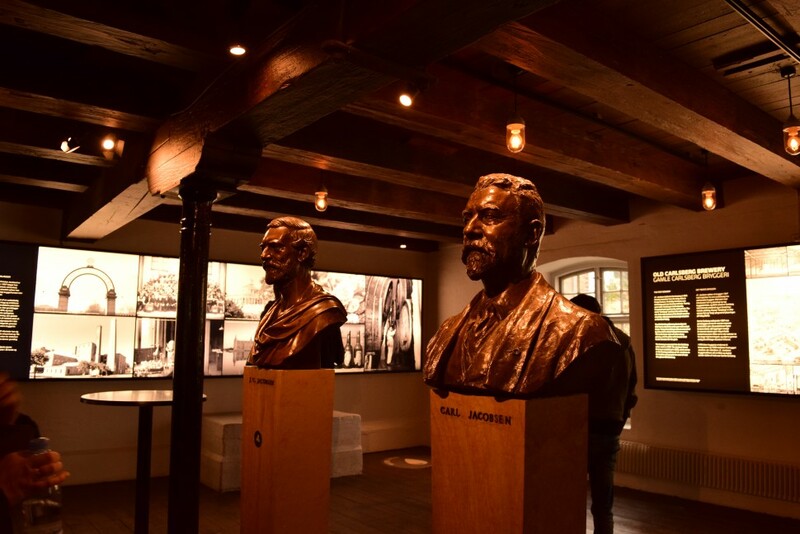 Two statue heads of the father and son that found Carlsberg. On the left the Father and on the right the son. Carl built his own brewery on the other side of the street from his fathers. If that wasn´t enough he even stole his father’s recipe on how to make the beer and even changed it so that the brewing became faster. This was Carls way of showing his father that he could so much more than just spending money on art. It did, however, end up in a war between father and son. But unlike most family problems this war didn´t just stay in the family. The people got involved in this war. They thought that it was their right to finish this fight between father and son. There’s a saying – do it before it’s too late – and that’s what J.C did. He invited his son on a trip to Rome just the two of them. After 5 years of war they finally become friends again in Rome. A few days after they made up J.C dies. Carl returns home to Denmark with his fathers body. Because of the fight between father and son Carl doesn’t inherit anything from his father. 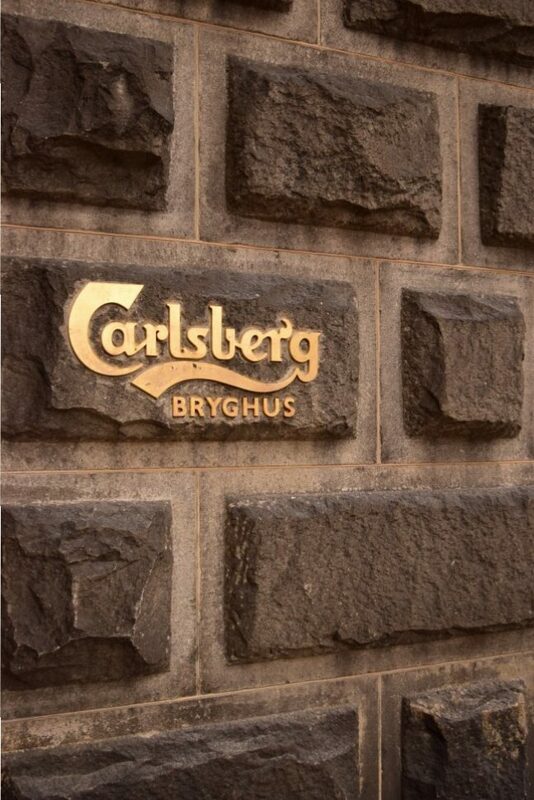 All of the money and buildings goes to the foundation of Carlsberg. Carlsberg is so much more than just beer. Over the years J.C and Carl saved a lot of our art history and castles. Unlike most wealthy people you can say that these two men are the peoples men. They want to share their knowledge and their wealth with the people of Denmark. J.C was very focused on science where Carl was more into art. Glyptoteket, Carlsberg library and even some of our castles are products from their contribution to our society while they were still alive. 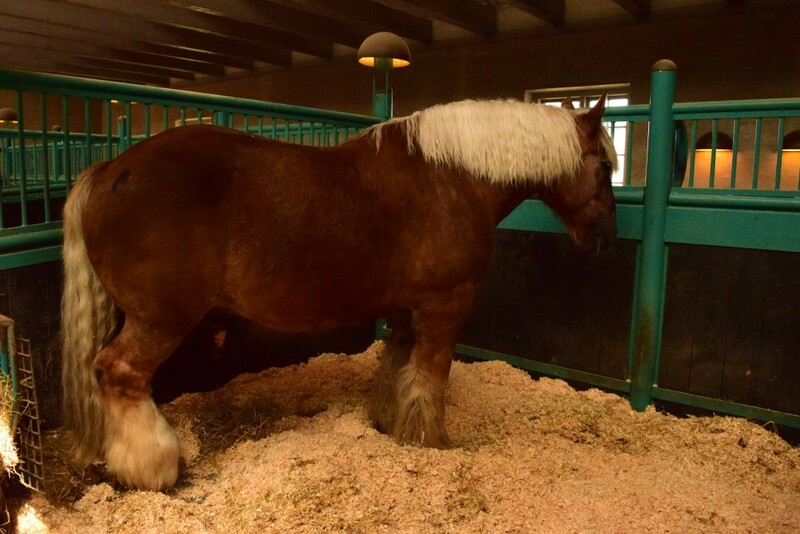 “It’s exciting to hear the personally history, see the history in the bottle collection and meet the carlsberg horses” – Jeongah 24 years old. This business is still a family business this day today just like it was meant to be. So now you can take your family and go take a trip into the old buildings or take a trip in a old horse-drawn carriage with the Carlsberg horses. From there you can take a trip down the Danish history and memory lane. One the 7 Carlsberg Horse there still take people on a tour in a horse-drawn carriage.